SINCE THE last amendment on February 11, 2005 to the Artlets Student Council (ABSC) Constitution, the eight-page document has been subjected to various amendment attempts by the different student councils that have taken office through the years. Last academic year, then ABSC President Reymark Simbulan proposed the amendment of the Constitution through a Constitutional Convention (ConCon). Its three reading sessions concluded on March 24. However, Faculty of Arts and Letters (AB) Dean Michael Anthony Vasco did not sign the proposed Constitution after the Faculty Council rejected the amendments. This caused the delay of the plebiscite, which was originally set to take place after the reading sessions. “Kumpleto na ‘yung signatures ng students. The next thing that we needed was the signature of Dean, not necessarily of the Faculty Council. Pero Dean wouldn’t sign it unless it has the approval of the Faculty Council,” Simbulan told the Flame. The Faculty Council is composed of Assistant Dean Narcisa Tabirara, Faculty Secretary Ma. Zenia Rodriguez, Asst. Prof. Josephine Placido, Asst. Prof. Anita Garcia, Assoc. Prof Emmanuel Batoon, and Faculty Regent Rev. Fr. Rodel Aligan. The council, specifically its legal adviser Atty. Antonio Chua, did not approve the proposed Constitution because of its content. Simbulan said the ConCon focused on specifying the powers and functions of the different actors in the Faculty. The power to vote, propose, and amend the Constitution resides in the block representatives and the Board of Majors (BOM), which acts as the sole interpreter of the Constitution. In the proposed amendment, “council” refers to all Artlets while “executive board” refers to all the elected ABSC officers. The role and functions of the BOM and the executive board’s power to appoint a Chief of Staff were also specified. The amendments also included a no-abstention policy, rules on the conduct of elections, and mandated the impeachment of any member of the executive board who fails to maintain a minimum semestral average of 2.5 during his or her term. Former BOM Speaker Neal Tayco disclosed that Atty. Chua challenged the traditional definition of the constitution and what it means to be a student leader and student council. “He doesn’t want the student council organizing events kasi para sa kanya, naging event organizer na lang ang student council which is wrong for him kasi nga, ang job ng student council is representation of students,” said Tayco. Simbulan added that Atty. Chua wanted the Council to be a supervising actor rather than a proponent, so the projects of the Council should be delegated to societies. “The Constitution is the fundamental and basic framework which basically promotes our rights […] Hindi siya self-enforcing. It doesn’t need to be too defined. Kapag masyado mong dinetail ‘yung definition ng constitution, nagiging rigid na siya,” said Iringan. It is now up to the current ABSC to decide whether or not to continue lobbying for the approval of Dean Vasco or to hold another ConCon this year. If they decide on the latter, the amendments in the Constitution made last academic year will not be valid anymore. Current ABSC President Rafael Arellano said they will prioritize student representation in the students’ code more but they will also continue to lobby for the signature of Dean Vasco. “It (ABSC Constitution) wouldn’t give much of a solution sa problems natin sa students’ rights kasi wala siyang gaanong weight kasi constitution lang naman ito ng ABSC, hindi naman ito constitution ng AB. So ang na-propose is mag-focus kami sa Students’ Code,” said Arellano. 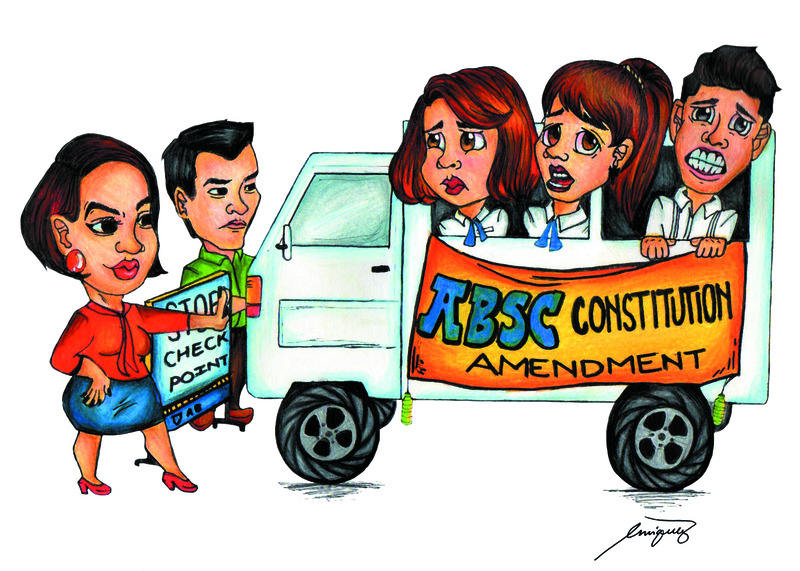 Iringan commended the ABSC’s decision to tackle the Students’ Code. “Siguro napagtanto rin nila na karamihan sa mga pinopromulgang artikulo at karapatan na nandun sa itaas (Students’ Code), at ‘yung mga nasaad dito (ABSC Constitution) ay hindi rin mapapatupad dahil wala dun sa itaas, so mababalewala,” he said.